Buttered ovendish which holds tomatoes snugly set against each other. Heat butter in a skillet and combine mushrooms, onions and garlic. Sautee over medium heat for 4 minutes. Using a skimmer retrieve and combine with herbs, tomato juices and egg, season with pepper and salt. Puree using a blender or food processor. 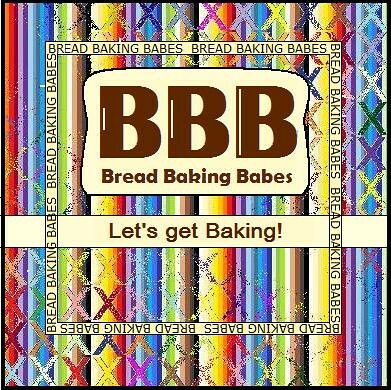 Bake in a preheated oven (200C) for approx. 25 minutes or until filling has souffleed and is firm to the touch. This looks like a great way to utilize summery tomatoes! And we're starting to get just a few of them ripening on our tomato vines!! It'll be great to have a huge list of great tomato recipes for the summer. Thanks for sharing this! I love stuffing tomatoes. The idea for your filling is great. I am so looking forward to making this. I am a first time visiter. Your blog looks great and everything looks delicious! 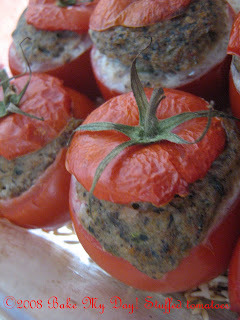 Perfect use for the 'store-bought- tomatoes I'm confined to using this summer!